The Kansas Gazeteer & Business Directory For 1882-1883Medicine Lodge . An incorporated city, the county seat of Barbour county, is located at the confluence of the Medicine Lodge river and Elm creek, in the eastern central part of the county, 30 miles due west of Harper, on the KCL&SK RR, its nearest railroad point, from whence it has a daily mail stage and 75 southwest of Hutchinson, on the AT&SF RR. Originally settled in 1872, it now contains a population of 700, has Methodist and Christian churches, district schools and 2 weekly newspapers, the Cresset and the Index. Live stock is the chief shipment. Tri-weekly mail stage to Hutchinson; fare $4.00. W.D. Van Slyke, postmaster. The Kansas Gazeteer & Business Directory For 1888-1889Medicine Lodge . A progressive incorporated city of the third class, the county seat of Barber county, formerly called Barbour county, is located at the confluence of the Medicine River and Elm creek, in the eastern central part of the county, originally settled in 1872. It is the terminus of the M.L. br. of the SK Ry, 336 miles from Kansas City. Attica is 23 miles east. Has daily stages to and from Kingman, 45 miles northeast, Bross, 23 miles northeast, Pratt Centre, 28 miles northwest, Sawyer, 18 miles northwest, Isabel, 14 miles north, Saratoga, 36 miles northwest, Iuka, 44 miles northwest, Elm Mills, 15 miles north, Mingonia, 9 miles west, Lake City, 18 miles west, Sun City 25 miles west, Nescatunga, 45 miles west, Coldwater 54 miles west, Ashland, 80 miles west, Lodi, 15 miles southwest, Canema, 16 miles southwest, Aetna, 35 miles southwest, New Kiowa, 21 miles south, Old Kiowa, 18 miles south. It has Methodist, Presbyterian and Christian churches, large public school building, 2 banks, 3 weekly newspapers, the Index (Dem) the Cresset (Rep) and the Chief (Labor), and is a distributing point for a territory 25 by 50 miles. There are Masonic, Odd Fellows, K of P and Ancient Order of United Workmen lodges, Order of the Eastern Star and GAR Post. There are also 3 hotels, of which the Grand Hotel is one of the finest and largest in Southern Kansas. Assessed valuation of personal property in the city, $110,397; real estate $228,145. No bonded or floating debt. Shipments, horses, live stock, wool and gypsum. Exp., W.F. & Co. Tel., S.K. Population 1,500. Mail, daily. Thomas A. McClearey, postmaster. The Original Barber County Court House, Medicine Lodge, Kansas. Photo from the collection of Kim Fowles. 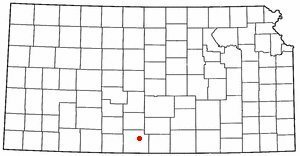 Medicine Lodge, Kansas, from the Barber County, Kansas: History & Genealogy web site. 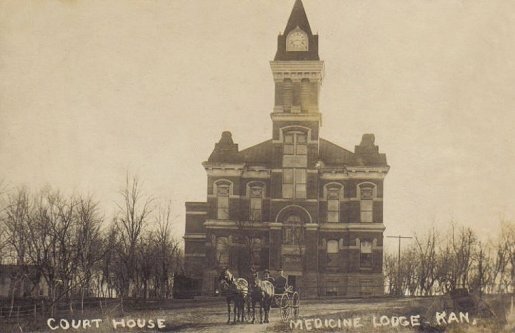 Thanks to Kim Fowles for her pemission to republish the above articles from The Kansas Gazeteer & Business Directory and the photograph of the original Barber County, Kansas, Courthouse. They were originally published online at the Barber County, Kansas: History & Genealogy web site.